Home Blog Great ideas for your year-end function! Spring is here and we’re already looking forward to the summer festive season, and that means one thing – end-of-year parties! 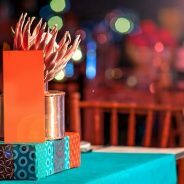 If you’re planning a function for your company, here are some ideas to inspire you, from our year-end function venue near Pretoria. Karaoke: There’s nothing like standing up and letting loose with the microphone to create a bonding experience with your team! According to the University of Oxford, singing together is more than just fun – it’s more effective at bringing people together than any other activity they tested. With a disco theme and a simple karaoke machine, your party is sure to be a win. Get active: Serotonin, the happy hormone, is released during exercise – and if your company is on a health kick, then getting active can be a fun year-end experience! There are plenty of activities suited to all levels of fitness, from treetop and nature walks to yoga and paintball. After a day out in the countryside, treat your employees to a fabulous local lunch or dinner experience to round it all off. Las Vegas extravaganza: Recreate the excitement and glamour of a night out in Las Vegas by setting up your own casino! Decorate your venue to match the theme and ask guests to dress in black tie formals for extra atmosphere and hire a singer or band for entertainment! This is the perfect theme if you are having an event that’s just for the adults. Picnic: Picnics are the best way to enjoy our incredible weather and the beauty of the outdoors – and they’re ideal for less formal year-end parties. They offer a lot of flexibility too, making them great for family-friendly events where you can invite entertainers to add to the fun. Luxury picnic baskets filled with goodies are a great gift that your employees are sure to enjoy! Please also remember to take the weather into account for a company picnic and ensure that your venue can provide you with an indoor space in the event of a rainy day. At Idle Winds, we offer our clients a wide range of function venues and services to ensure that their year-end events are a success! With a dedicated team, experienced staff and a beautiful scenic location just 14kms from Fourways, we’re the ideal venue for corporate functions. In addition to our function venues, we also offer clients the use of comfortable on-site accommodation and our award-winning restaurant. For more information about our year-end function venue near Pretoria or how our team can assist you with this important occasion, please contact us today.